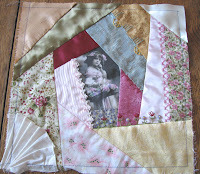 Part 1 was designing a block and choosing the fabric. I chose twelve different fabrics. 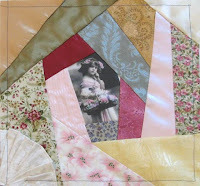 I now think I have my work cut out for me choosing 2 fabrics with so much detail. For Part 1.2 I added a fan. I wanted something that would compliment the little girl and her lacy dress. Oh I don't like how the fan is so uneven on the left side. I definitely must re-think my options. 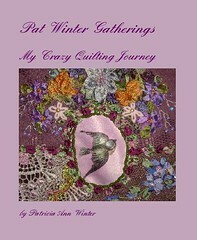 Part 2 consisted of 10 different stitches using 3 types of thread stitched on a sampler made for this project. 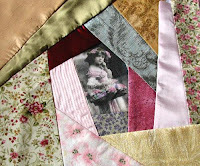 Then choosing 3 stitches used on the sampler, embellish 3 seams. Part 3 was trying to design 10 stitches of my own (the best we could). 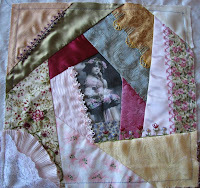 The next step was to embellish 2 seams chosen from the 10 stitches just created on the sampler. I also decided to change my fan. I like it so much better. Don't you think it looks like it is a piece from her dress? Oh my, the block looks wrinkly! Plus I had to add muslin around the edges to fit into a hoop. Those stitches just were not cooperating without one. Now on to Part 4...... Beading...... and off to the ironing board. Oh that's beautiful! I love the little flowers seam! And I love the fan in the corner too!